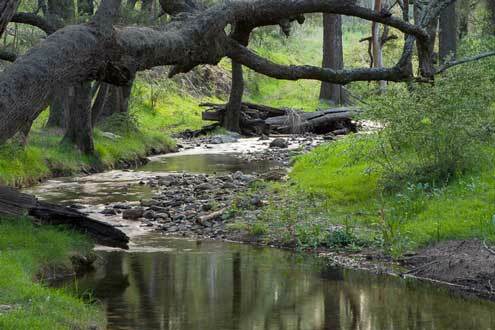 The forested wetlands of the Blue Mountains occur mostly as narrow strips of river oak along larger rivers and creeks. Some areas of coastal floodplain forest remain at lower elevations in the east, where the fertile alluvial soils support small remnants of apple-gum woodlands. Forested wetlands, also known as swamp sclerophyll forests, are freshwater wetlands dominated by trees. They occur across just 0.5% of the Greater Blue Mountains on the fertile alluvial clays and sandy loams of the larger river valleys. These habitats are structurally similar to other forests in that they are dominated by sclerophyllous trees; however, their understorey is distinctive, being comprised of plants that are able to survive periodic inundation. 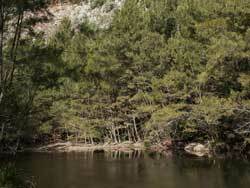 Two classes of forested wetlands are found in the Greater Blue Mountains. Both occur as very narrow, linear strips along watercourses and their ecology is driven by flooding events. Coastal Floodplain Wetlands occur on rich, alluvial soils in the eastern parts of the Greater Blue Mountains, where creeks and rivers reach low lying terrain on the edge of the coastal plain. Alluvial flats and elevated terraces along these creeks and rivers support forests of Rough-barked Apple (Angophora floribunda), Cabbage Gum (Eucalyptus amplifolia), and Forest Fed Gum (Eucalyptus tereticornis), with an understorey of sedges, grasses, herbs and scattered mesophyllous shrubs. Where they extend further upstream, these wetland forests include the narrow strips of Prickly-leaved Tea Tree (Melaleuca stypheliodes) growing in the alluvial soils in places such as the upper Grose River. Eastern Riverine Forests occur along major, fast-flowing rivers where they can be easily recognised by the presence of a single dominant tree species, River Oak (Casuarina cunninghamiana), which can grow to a grand size. 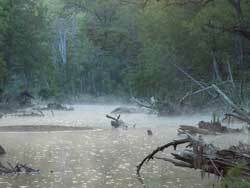 The typical habitat of these forests is the sandy, cobble-stone river margins, which are subject to periodic flooding. 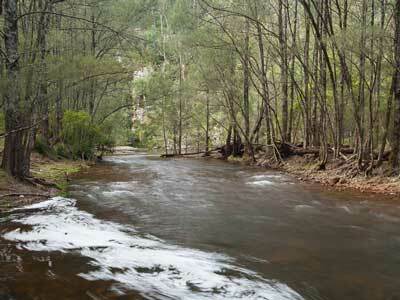 In the Greater Blue Mountains, these forests occur most prominently in the western parts of the region, along the Cox, Kowmung, Wolgan and Capertee rivers. River-flat Eucalypt Forest on Coastal Flood Plains (endangered) is likely to occur at low elevation along the major rivers in the eastern part of Blue Mountains National Park. With flowers that resemble some of those of the acacia family, this beautiful tree grows over 10 metres high along watercourses. It flowers in spring. This image shows its dramatic new growth. A unique plant - with its pink flowers hanging down and its six leaves radiating from the stem. 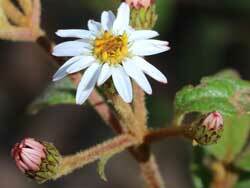 It flowers in spring and summer and prefers sheltered damp embankments. 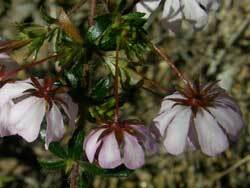 It's also known as the Dog Rose. This endangered species is confined to the Blue Mountains. 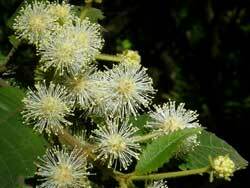 It's identified by its oak-like leaves which are around 40mm long and 20mm wide. Resilient River Oaks (Casuarina cunninghamiana) act to bind and control river channels, and are periodically ripped out by floods. Even in narrow gorges, River Oaks (Casuarina cunninghamiana) can find a place to take root and grow…as long as their roots are in damp ground. River Oaks (Casuarina cunninghamiana) are just as happy on alluvial flats. 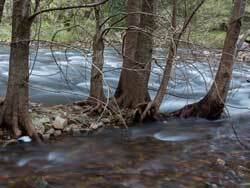 They line most of the large streams in the Blue Mountains, where they are one of the tallest tree species.